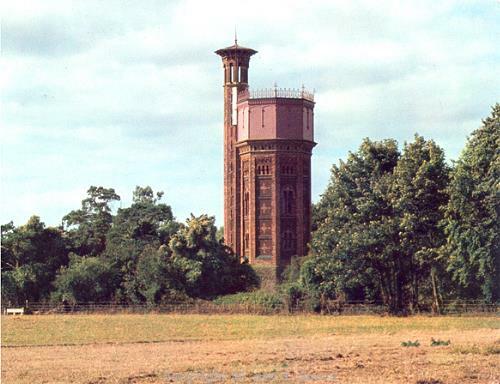 The large coastal civil parish of Sandringham is situated in northwest Norfolk, south of Dersingham. Its name comes from the Old English for ‘sandy home of Deorige’s people’. The parish has a long history, and settlement was certainly well established by the time of the Norman Conquest, the parish’s population, land ownership and productive resources being detailed in the Domesday Book of 1086. The earliest evidence of human activity comes in the form of prehistoric but otherwise undateable stone tools, including a flint flake (NHER 22148), a stone saddle quern (NHER 12537) and unspecified worked flints (NHER 3260). The oldest object to which a firm date can be given is a Palaeolithic flint implement (NHER 3249) found in 1922. There are currently no Mesolithic finds. Neolithic flint tools recovered include polished axeheads (NHER 1566, 3251, 22147 and 31141) and a partly polished chisel (NHER 11184). An oval mound (NHER 41129) noted in 2003 on a low ridge could possibly be the remains of a Neolithic or Bronze Age barrow. The only Bronze Age find to date is a barbed and tanged flint arrowhead (NHER 22147). The Iron Age has so far left no trace of its passing. There is rich evidence of Roman occupation in the parish. In West Newton, excavations between 1949 and 1951 revealed part of a Roman villa and bath house (NHER 3254. Tiled floors, a hypocaust, a limestone chimney flue and bricks were discovered, together with a refuse pit containing pottery fragments and oyster, mussel and cockle shells. Other building materials recovered were coloured plaster, floor and roof tiles and window glass. Small finds included pottery fragments, iron slag, part of a shale bracelet and beads. The dateable evidence suggests the site was occupied in the 3rd and 4th centuries. A further probable villa (NHER 3253) has been recorded at West Newton Farm. Roman urns found in 1882 and 1903 in gravel pits west of the main Hunstanton Road suggest the presence of a cemetery (NHER 3256). 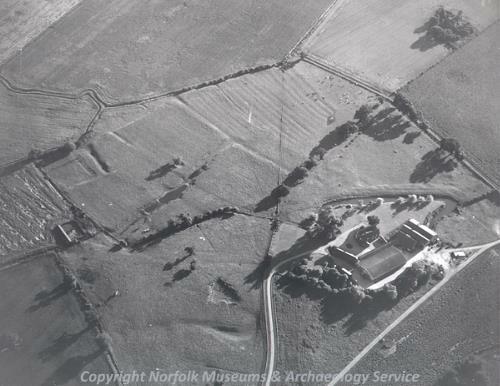 Quite a few Roman salt-making sites have also been identified from aerial photographs, selected examples being NHER 1562, 1563 and 16499. Roman objects recovered from elsewhere in the parish include coins (NHER 2196, 11632, 16814 and 16815) and pottery fragments (NHER 3260, 22148 and 40551). 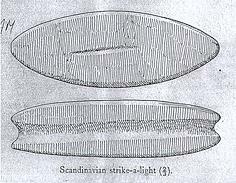 By contrast, the only Saxon finds to date are pottery fragments (for example NHER 22147 and 3257) and a strike-a-light (NHER 3261). The medieval period has left the parish with its earliest surviving buildings, its three churches. Of these, the oldest is St Peter’s in Wolferton (NHER 3277), a large late 13th century church. Apart from the carstone walls and west tower, it was destroyed by a fire in 1486, after which it seems to have been given the roofs admired by 18th century antiquaries. By the 1880s it was in a sorry state, but thanks to the building of Sandringham House (NHER 3272, see below), the subsequent revitalising of the local economy and the patronage of the Prince of Wales (later Edward VII), was given a thorough Victorian restoration by Arthur Blomfield, who also restored the other churches on the estate. He replaced the roofs in both the nave and chancel, and most of the coolly austere interior is his. However, there are three fine medieval survivals, a beautiful 14th century parclose screen to the south aisle, which must have come from somewhere else, a 15th century parclose screen to the north, and the dado of the rood screen, which has twelve faint figures on the panels. St Peter and St Paul’s Church (NHER 3278) in West Newton has a stately 14th century unbuttressed west tower of carstone with freestone corners. A contemporary image niche sits beside the west window. The pinnacles are 19th century additions. The doors and arcades are 14th century. The body of the church is also largely of carstone, consisting of a nave, chancel, north and south aisles and north chancel extension. The building was in a poor state by the 19th century, until the Prince of Wales bought the Sandringham Estate. Once again, his patronage led to an almost complete restoration of the church in 1881, when the north aisle was rebuilt, the nave roof renewed and the south aisle given wide, almost domestic mullioned windows. The stained glass dates to this restoration and the years following it, except for a vivid window in the north aisle commemorating the men of the Sandringham Company of the Norfolk Regiment who fell in the disastrous attack at Suvla Bay, Gallipoli in 1915. Inside, beneath the 14th century tower arch sits a slender 15th century octagonal font with a tall and elaborate pinnacled wooden cover, given in 1881. Gifts to the church from royalty and others include the organ, the chancel stalls, the pulpit and the altar reredos. The elaborate lectern was given by Blomfield. 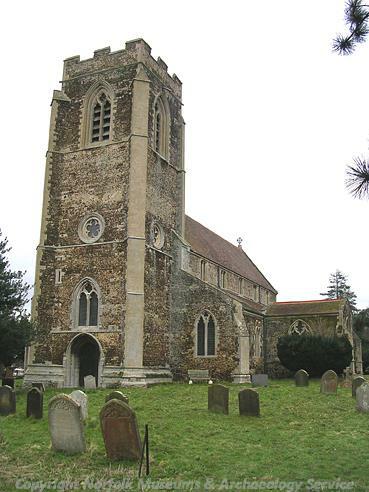 St Mary Magdalen’s Church (NHER 3275) in Sandringham itself is a 14th and 15th century parish church of carstone with stone dressings, originally consisting of a west tower, nave, chancel and south porch. It was transformed by 19th century rebuilding, firstly in 1857, then in 1890, when transepts, a north aisle and a south chapel to the chancel were added and the interior rebuilt. Inside, the nave roof is from 1921, that of the chancel 1890. As a result of connections with the Royal family, who have regularly attended services for more than a century when staying at Sandringham House, it is at first hard to take in all the interior fittings, the chancel being the most lavish of all Norfolk parish churches. There is no part of the chancel that is not either painted or encrusted with rich decorative schemes, almost all of which were introduced after 1910 as a memorial to Edward VII and paid for by the Royal family and friends. The fittings include a solid silver altar and reredos of 1911 and 1924, an oak and silver pulpit of 1924, an aluminium and ivory statuette of St George of 1892 and a 16th century Spanish silver processional cross. There are also memorials to Queen Victoria, Edward VII and Queen Alexandra, George V and Queen Mary and George VI, though of course none of them are buried here. Some fragments of medieval stained glass survive, but most of the glass is 19th and 20th century. A tomb slab of 1544 with brasses is set against the porch wall. In the churchyard to the west of the tower is a 10th century inscribed square font cut from a solid block of marble, a gift from the then Duke of Edinburgh in 1886. Other medieval structures have not survived, and indeed two entire settlements have since disappeared. The medieval village of Babingley (NHER 3257) lay to the north of an area of reclaimed marshland which was at one time a navigable estuary about 3km inland from the Wash. The visible remains include part of the moated site of a medieval manor house, now Hall Farm, trackways, enclosures, an adjoining arable field system and a second smaller moated site, possibly once containing a dovecote. About 200m to the west of the remains of the village and standing isolated in farmland are the overgrown ruins of the Church of St Felix. The remains date to the 14th century and later, but may be on the site of an earlier church, as there is a tradition that it was here that St Felix of Burgundy landed in A.D. 631 on his mission to convert the East Angles to Christianity. Saxon pottery fragments found in the area certainly suggest a pre-Conquest settlement. Wolferton medieval village (NHER 3259) consist of faint earthworks, visible as boundaries, banks and ditches on aerial photographs. A few features, including two tofts, can be seen on the ground. Butler’s Cross (NHER 3258) is a medieval standing stone cross, consisting of the base and a fragment of the shaft, set on a modern plinth of stone and tile with a plaque and surrounded by remains of a rusty iron fence. It is located at the junction of the B1439 to West Newton and the A149, and once marked the boundary of Rising Chase. The name of the cross derives from the de Boteler family who held the manor of West Hall, Babingley from the 13th century. The salt-making industry continued during the medieval period, and a large number of probable saltern sites (for example NHER 36938 to 36952) have been identified from aerial photographs. Sandringham is undoubtedly best known for Sandringham House (NHER 3272), the country retreat of the Queen and the Duke of Edinburgh, where members of the Royal family spend Christmas and make it their base until February each year. The estate was bought by the Prince of Wales, the future King Edward VII, in 1862 from Charles Cowper. Of the 18th century and later house on the site, the Prince retained only the mid 19th century conservatory, incorporated as a billiard room, rebuilding the rest in a rather frenetic Jacobean style between 1867 and 1870. The house is of brick with stone dressings with many gables and two cupolas, one on a turret. A ballroom, in the same Jacobean style but more flamboyant, with a coved and stuccoed ceiling was added in 1883. The upper storeys were rebuilt after a fire in 1891 and a new storey added to the bowling alley. Large portions of the servants' quarters to the south were demolished in 1974. It is impossible to fully describe this impressive building in a short summary, particularly the splendid gardens and fascinating interiors. The gardens and the main ground floor rooms are open to the public when the Royal family is not in residence. The house is set within the splendid surroundings of Sandringham Park (NHER 30486), and buildings within the grounds include Folly Lodge (NHER 3276), West Newton Club (NHER 12535), a good example of a Victorian estate house, an ice house (NHER 19082), a game larder (NHER 19424) and a stud (NHER 33711). At the entrance to the grounds are the Norwich Gates (NHER 3274), heavy, sumptuous and elaborate cast and wrought iron gates. Two smaller gates flank the larger pair, and all are set between curving iron screens. Heraldic beasts support coats of arms on the gate piers and on brick columns at the ends of the screen. The gates were designed by Jekyll of Norwich for the Great Exhibition of 1862 and then given by the city and county to the then Prince Of Wales as a wedding present in 1863. They were moved to their present position in 1908. The Old Norwich Gates (NHER 12536) are cast iron gates of 1724 with simple decoration. They were formerly on the north side of the old house replaced by Sandringham House. 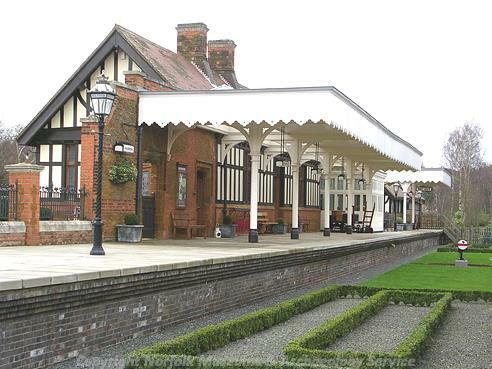 The King's Lynn to Hunstanton railway (NHER 13591), via Sandringham and Heacham, opened in 1862 and closed in 1969 (although King's Lynn station remained open, see NHER 13594). All of the railway track has been removed since 1969, although many buildings survive. These include stations at King's Lynn, Dersingham, Snettisham, North Wootton and Wolferton and several signal boxes. West Newton Flax Factory (NHER 44312) was established in 1935 for crops grown on the royal estates. It was visited by King George V and Queen Mary in 1935, and by Edward VIII on his only visit to Sandringham. The factory was taken over by the government in 1939 and used for wartime supplies as one of twelve British mills. It closed in 1958. The most historically recent entry on the record is a rare World War Two 'Hedgehog' type anti-tank block (NHER 32383) of about 1940 that survives on the north corner of Babingley Bridge. P. Aldridge (NLA), 18 July 2007. Pevsner, N. & Wilson, B., 1997. The Buildings of England: Norfolk 2: North-West and South (London, Penguin Books)Knott, S., 2005. ‘The Norfolk Churches Website’. Available: http://www.norfolkchurches.co.uk/westnewton/westnewton.htm Accessed 18 July 2007. Knott, S., 2005. ‘The Norfolk Churches Website’. Available: http://www.norfolkchurches.co.uk/wolferton/wolferton.htm Accessed 18 July 2007.